Vent-Axia Heated Towel Rails quickly warm and dry towels. Their presence on the wall also adds to the overall style, temperature and comfort of the room. This comprehensive range of white and chrome towel rails offers 10 different models across the flat, curved and designer ranges. The range offers sizes from 500 x 600mm to 500 x 1500mm available in four heat outputs of 100, 150, 250 and 400W matched to the size of the rail. Adequately heating your bathroom using a Vent-Axia towel rail not only leaves your towels warm and dry, but helps regulate temperature to the rest of the room decreasing the chances of mould and condensation. Sizing the correct towel rail can be made easy by using our online heating tool available on the website www.vent-axia.com/heating-guide. 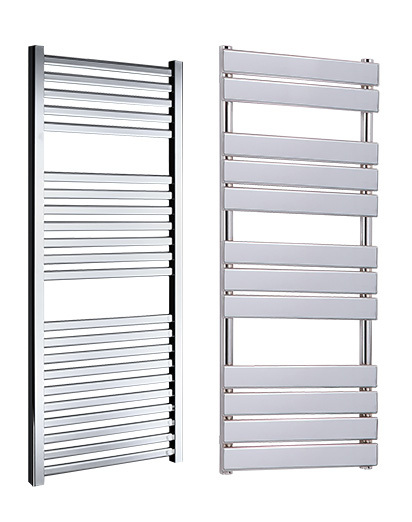 With the Vent Axia range of towel rails you will find a towel rail to suite all applications and sizes. Every towel rail uses thermally regulated heating elements and a mixture of high inertia fluid to order to maintain even heat distribution around the entire rail. This advanced controller available in white and chrome gives you the control of five heat outputs and offers an eco mode ideal for use when drying your towels to ensure minimal energy use. This feature turns on the rail on full power for 30 minutes then reduces the output to the user setting for a further 90 minutes before turning the towel rail off. The duel fuel kits allow you to electrify a wet towel rail for use in the summer months when you don't have your heating on. These parts are also the spare elements for use with our new range of towel rails.